Past life recall, health and healing. Interesting past life recall last night. For the past couple of weeks, as I lay down to sleep, I’ve noticed George show up beside me to rub my feet. Weird eh? I figured it must have something to do with whatever we were doing after I went to sleep, or maybe it affected the quality of my sleep, or maybe it was balancing my energetic body somehow. I never asked him why, because by the time I notice it the part of my brain that asks such questions is already asleep. It has just become this routine. Almost asleep and Oh yeah, there he is again. It’s nice, and I’d never reject a foot rub. Well last night, in addition to George, I had another spirit friend pop in, who shall at this time remain nameless because for some reason I’m struggling with coming “out” with this one. Want to test your own psychic skills and try to guess? I’ll give you a hint – it’s yet another male energy. Last night New Friend shows up while George is handling my feet in this loving way, and I suddenly get this fear I used to get right before going into a past life recall. I just sat with the fear for a minute, New Friend offered his hand, there’s George sitting at my feet, and this memory just floated down to me. It wasn’t anything like the past-life recalls I’ve experienced before, where I was virtually re-living parts of it. It was like this past life of mine was a blanket floating in the ether, and it gently descended onto my body and my mind, and in that moment I completely remembered what I needed to know from that life, just as though the memory was already there. Oh. I said to myself. 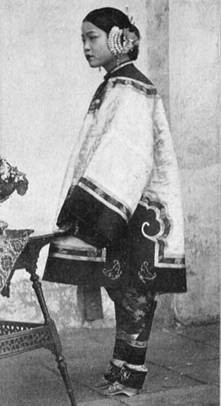 In this past life, I recalled being a woman in China with bound feet. I understood this lifetime of restriction as a result of my feet, and I accepted it without protest or question. My feet caused me pain and illness, but these were not things to be avoided or denied in life, they were simply there, like breathing. There was no sense of *suffering* in this life, although there was fear and vulnerability of not being able to run when I felt like I needed to get away. The thing about having bound feet that I loved, especially as an older woman, was the daily care and attention I received. My daughter / daughter-in-law (not sure which, but we loved each other) would bathe, doctor and dress my feet every evening. It was the only loving contact I ever received in my whole life. It was the only time I was ever touched with tenderness and caring. These feet which caused illness and imbalance were the only reason I felt love. And so this is where my illness = love & care association began. This recalled memory was appropriate for me now at this time when I am reprogramming my body, my cellular and energetic structure, to be perfectly healthy and strong for the rest of my life. I needed to recall the origin of my desire for illness in order to release it. It explains the immediate familiarity when I first sat in the kneeling yoga posture. It lined up my spine perfectly, but my feet felt so huge! I thought they felt like giant flippers, and I could only sit in kneeling position for a few minutes at a time before the pain in my feet forced me to move. It was after listening to one of Aleya Dao’s healing meditations while sitting in this kneeling posture and declaring I was ready to let go of fear, that I received the healing that released my low back. After I released the posture, I lay on my back, knees tucked up to my chin, and I rocked back and forth a bit – CLICK! My back was fixed. Even as I type this I just noticed how again I am sitting with my legs crossed, and the foot that has contact with the floor is curled so that only the outside arch of my foot is making contact. That life I spent with bound feet was a time of imbalance, literally and energetically. I could never become grounded once I could not walk barefoot on the ground. My feet barely touched the ground, and everything I experienced in that life, all the emotions and illness, was stored in my energetic body without a pathway of release. I asked New Friend to stay with me all night, and he did, which I know because I woke up several times and he was there, reassuring me I was not alone. There’s something about past life recall that makes me feel very vulnerable and frightened for a time, and having a friend there to oversee and be a protector of sorts is incredibly reassuring. When I moved through some brief “wake up” yoga stretches this morning, where I reconnect with my body and realize it has been completely healed & restored through the night, I felt a new wave of utter gratitude as I said my exercise mantra: Thank you for this body that is so healthy, well-balanced and strong. ← Popemobile and Mary T.
Oh hey, I just remembered something. A long time ago (like maybe a year ago) we were talking to Happy (the dog) trying to figure out why he kept wigging out any time I would touch your feet. Then you had a realization that you’d had a life where your feet were injured and that there might be some residual vulnerability around that that you were projecting, that he was picking up on so he felt like he needed to protect you. I don’t think you’d placed it in context at that time though, just an understanding that feet = vulnerability. Oh yeah!!! Holy crow. Our dog is awesome. I think he easily gets overwhelmed and fearful sometimes because he’s so incredibly sensitive to little subtleties. It’s true. Actually I think we have that in common. I always thank him for coming in small for me. So cool!! I am actually jealous as I would love to know my past lives. , Don’t you just love love when things click and finally make sense.? Ok…Ill guess MJ or Elvis lol. The only reason I brought those two up is because MJ is around me a lot and I had a recent dream about Elvis that then lead to a George and John moment. Actually I’d have no issue writing about MJ or Elvis. I think a year or so ago Sweetie & I had a conversation with those two, within minutes of each other some Sunday morning. It was more to satisfy our own curiosity, and I never really knew what to think of Michael, given all the accusations leveled against him and his very public childhood exploitation. I guess I just wanted to understand what he was about. Neither he nor Elvis really *clicked* with me in a lasting way, though, which is just a personal thing for me. It was just a one-time conversation and then off they went. I don’t think we even discussed anything particularly profound. Prepare yourself in a way that has you feeling relaxed and safe. No one should interrupt you, and you should be able to fall asleep afterwards so that what you learned can “set”. Then give your imagination permission to just run with whatever comes. This experience can feel a lot like you being a little kid and playing “let’s pretend” games. Forget about doubt or self-editing, who cares if what you’re experiencing is believable? You don’t have to tell anyone. This is a private experience for you. You’ll sense / see in your mind’s eye / imagination someone come forward to help you. They’ll ask for permission to work with you, and you can assess how safe you feel with them. There are a lot of theories about how often or how many past lives we have had… I encourage you to search the blog for “soul bubbles” to learn more about how complicated a question “How many past lives have I had?” can be – and that’s considering time as linear. You have future lives too, that can be explored in the same way. Actually, I’m going to post this as a new entry – thank you Nikki! I’ve had “love train” in my head all day since writing that post, and I don’t think that’s exactly a hint. It’s more what he’s doing. Join the Love Train, the Love train, yeah! Yes, he picked both of the pictures in the post, and I can only assume they’re clues. 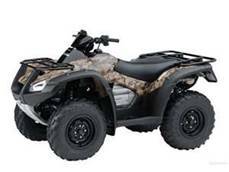 Why the f would I put a four-wheeler in the post, anyway? I have no idea why he wanted that in there. I assumed it’d be a clue for somebody. Anyway, I’d apologize for the teaser but I’m not sorry at all! Haw! Yeah, I haven’t actually agonized over anything like this since my very first John Lennon post. I probably just need a bit of time to feel more comfortable. You may be getting something by the way. The bald male face is not the spirit, but probably someone else’s photo I was looking at a lot yesterday. He is a large bald man, but he’s alive. And were I to tell you who that person was, I’d probably give away who this other person is. So close, my dear Kitty, but no cigar! Then ask who held my hand last night. Try it! And EMAIL YOUR GUESS TO ME (tofinopsychic@gmail.com) so that it doesn’t influence others who want to try this exercise. If someone gets it and posts it in the comments, other people won’t get a chance to try. Ha! That’s what I was trying to do (but in a somewhat distracted way because my ponytail was too tight) when I got the images of the bald guy. So I’ll go back and try it again later (sans pony tail) and email you if I get anything. 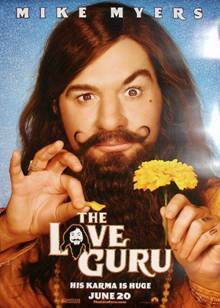 Funny you should have posted The Love Guru poster image — I’ve been reading http://superaalifragilistic.wordpress.com/ lately and his last two posts have been “The Foolproof Guide To Becoming A Guru”, a tongue-in-cheek guide to becoming a guru. (I’ve also been looking at maybe watching the documentary “Kumaré”, where a guy decides to pretend he’s a guru and film people’s reactions. I’m conflicted about it because it’s a mix of funny in a Borat kind of way but it’s also kind of cruel.) So silly gurus have been on my mind lately. So we are learning! Excellent, my young disciples *evil finger tent* it is all falling into plaaaace… Muah – muah – MUAH HA HA HAAA! But seriously, two people have emailed so far and have correctly hit upon the personality! TIP: do not attempted to “interpret” or draw conclusions on what you get – just say what you get and REMAIN OPEN! Then try to ask for details to fill in the blanks, like: old or young? Fat or thin? Talk or short? Sad or happy? Sometimes honing your psychic skillz is playing 20 questions! Eventually you will program your brain to ask these questions automatically, and through experience and trial and error, you will find the information comes faster and more accurately! Be brave! This guy is committed to visiting any one of you who want to try. Talk out loud too, (not only in your head) they can hear you!